Jerry Lee Lewis Online Wild One's Clubhouse: The Largest Jerry Lee Lewis Homepage on the Internet! 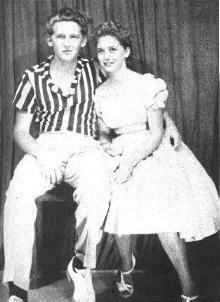 Jerry Lee and Myra shortly before their marriage in 1957. Devin: Do you remember the first time you saw Jerry Lee? Devin: So he kind of stood out from the beginning. Devin: And that he let Jerry stay your guy's house and so that really helped his career out of course. Myra: Well what had happened was that Jerry had been to Nashville, like I said earlier, he had auditioned and hung around and I think he had enough money to stay 3 or 4 nights in a hotel. When his money ran out he hitched hiked back home because he was just...I mean...he came...his father was a sharecropper...they had no money....they had absolutely no money.... no money to do anything with. So Jerry had already been and thought that is was a useless situation to try and audition. And because he had been turned down so many times, and when Daddy said "You come to my house and stay" well this was a Godsend. Jerry came to my parents home and stayed for about 8 or 9 months (laughs). Devin: Because Memphis Tennessee was where it was at right then. Myra: That's right...that is exactly right. And it happened so fast...Rock'n'Roll, at that point, was in its infancy. It was nothing to have Jerry go into the studio and cut a record on Monday morning, and on Tuesday afternoon hear it on the radio. Devin: 'Cause Dewey Phillips was down there...back in the days when disc jockeys got to play their own music. Myra: That's true..that is very true...they did..they..played what they wanted to play back then. Devin: Then of course, Jerry Lee had an extraordinary rise to fame. It skyrocketed after he did the Steve Allen show. Then you guys got married in December of 1957. Devin: Oh! I wanted to ask. Kay Martin...I have been talking to Kay Martin lately. For the audience, Kay Martin was the cofounder of Jerry Lee Lewis's original fan club, I believe it was back in 1957. Devin: Before he really made it big. She was telling me about how you had to hide out at the Paramount in New York City in the hotel room. You couldn't go down to the show because they didn't want anything to get discovered as far as your marriage was concerned. in me and said "Myra keep your little mouth shut about who your are" I could have done it! I could have handled it! Because I was the one who let the cat out of the bag when we went to England. When a reporter came up to me, because he (the reporter) saw me get off the plane with the rest of the crowd. He knew I was a part of Jerry's entourage. He came up to me and he said "Who are you?" and I said "Oh, I am nobody" he said "No, no, no...who are you Miss?" and I said "Well...I am nobody, but you know, I am Jerry's wife". You would have thought I had shot a cannon in the air. The guy took off running.......it was a major explosion. I thought "My God, what have I said?" If Jerry's managers had been smart enough to tell me to keep my mouth shut hopefully I was smart enough that I would have done it. I am not positive I would have (laughs) but I think I would have had the idea to keep my mouth shut...you know. Devin: On the way home from England, now if people don't know, In England, Oscar Davis was managing that tour, they had a sold out tour. Jerry Lee was taking over Rock'n'Roll as the King of Rock'n'Roll, he was the King of Rock'n'Roll. On the way out of England his career was ended. On the plane ride home from England, that was a long plane ride, what were you thinking? Do you remember what you were thinking? Myra: You know ..........we were so young and stupid, and not young and foolish, but young and stupid OK, that we thought when we got back home it was going to be all gone away. We thought we would arrive back in America and they would say "Oh you poor babies....they treated you so bad...come on in and let us make it right" But that was not the way it happened because you see, once England created the scandal, Americans, though especially the newspapers and the news media and all that, they were ashamed of us. It was like you really brought rack and ruin on all of us now. And you gotta remember Rock'n'Roll at that point was the new evil kid on the block...OK? Parents resented it. They said that it caused Juvenile Delinquency that it was riotous and it caused children to do bad things and now the news media had one more thing that they could point their finger too and say "See! 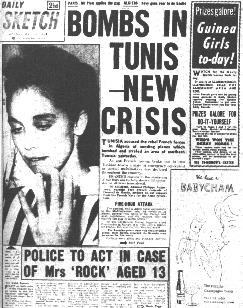 We told you Rock'n'Roll was wicked...look what it does...it makes men marry young girls". Devin: The thing that no one ever talks about is that maybe he (Jerry) loved you and that you loved him. Devin: It was never was brought up. It is just like the media today, they never change, their always going after somebody or something. Myra: It's always a witch-hunt. Devin: 1958 was a pretty bad year for Rock'n'Roll. Chuck Berry was arrested Little Richard denounced Rock'n'Roll and threw all of his jewelry into Sydney Harbor down there in Australia. Elvis of course was drafted. So it was a hard time for Rock'n'Roll in 1958. Myra: Yes it was. It was making so much racket because it (rock) was the new big upcoming, I mean, larger than anything that we have going on now because now you have, i would guess, 50 to 100 categories of music, back then, you had maybe four. You had crooners like Frank Sinatra, totally different ya know, that is a totally different music. Then you had plain ol' twangy kind of country music, and it was real real take your shoes off and pick the guitar kind of country music not like you have today. Myra: You had religious music.......you had classical, and then this wild hellion hellraising group that busted through the door and calling themselves Rock'n'Rollers. Devin: It (rock'n'roll) could have only came from the South, it couldn't have came from the North. People don't releaize that. I wanted to talk about after the scandal it was really hard. Jerry Lee went from making 10,000 dollars a night to 250 a night and this was back in the late 50's so this had to of been hard. From what I have read you guys pulled together during that time and tried wait out the storm because you had all these people against you. Myra: Everyday Devin we thought that is was going to be the last day of the scandal. Everyday for ten years it was going to change. It was like "OK tomorrow we are going to get up and it's gonna be better...it's gonna be better." And those were the times...ya know if you want two people to cling together and unite, have an outside force attack the two of them, and that is when people cling together and hold on to each other and say "We are gonna make it through this." Those were the happiest years of our lives. This is part two of a four part interview with Myra Gale Lewis. Come back again soon for part three. This site maintained by a fan for the fans!